We're of the school of thought that a powerful car and a lonely road can cure many of the world’s problems. Those lucky few who got a nod from Ford for the ability to plunk down $400,000 for one of the limited GTs had to promise the automaker that they would share their cars with the auto-loving community by taking them to shows and making videos about them as we’re sure Shmee will do. But as any post-pubescent human knows, the real magic happens in private with the doors closed. That's why we’re certain that the majority of GT bonding experiences will happen on curvaceous lonely roads. 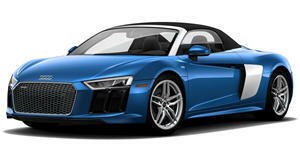 Same goes for any car, especially a German supercar like the Audi R8 Spyder. Drivetribe, a pet project of the old Top Gear trio, wanted to get that magical bonding experience with its long term R8 and a lonely road in the Alps before the ice closed it for the season. So sit back and reserve emotions of envy for Features Editor Henry Catchpole. Ten cylinders bounce the wailing cry of its naturally aspirated peoples against the avalanche tunnel walls with no cloth top stopping the noise from infiltrating the cockpit. Some German engineering student toiled nights, skipped out on pub crawls with friends, and withheld from hot dates just to perfect the metallic crackle of each crisp downshift, so we’re damn well pleased that Catchpole iterates to the camera just how deeply he enjoys the experience, more so because the winter tires and salted roads force the R8’s chassis to wrestle and squirm with the limited amounts of available grip. “The mass of men lead lives of quiet desperation,” claimed Henry David Thoreau. Thanks to this video, we know it's possible to escape that fate.